Starmark's Treat Dispensing Looper is a new take on their amazing food toys. The Looper is a large ring that bounces, floats, and can be filled with kibble or small treats for added fun. It is available in two sizes, ours is the larger one. We've had one of our Treat Dispensing Chew Balls for well over a decade now, but Starmark has recently decided to think outside the ball. They've expanded the flexible, chewable, treat-dispensing toy concept into other shapes. We have their dumbell-shaped Treat Dispensing Squeakee, and now we have the Looper as well. They're all made with the same durable material that is easy on teeth, walls, and furniture. I can easily see that the Chew Ball, Squeakee, and Looper are all variations on a theme, but they each have their unique qualities. 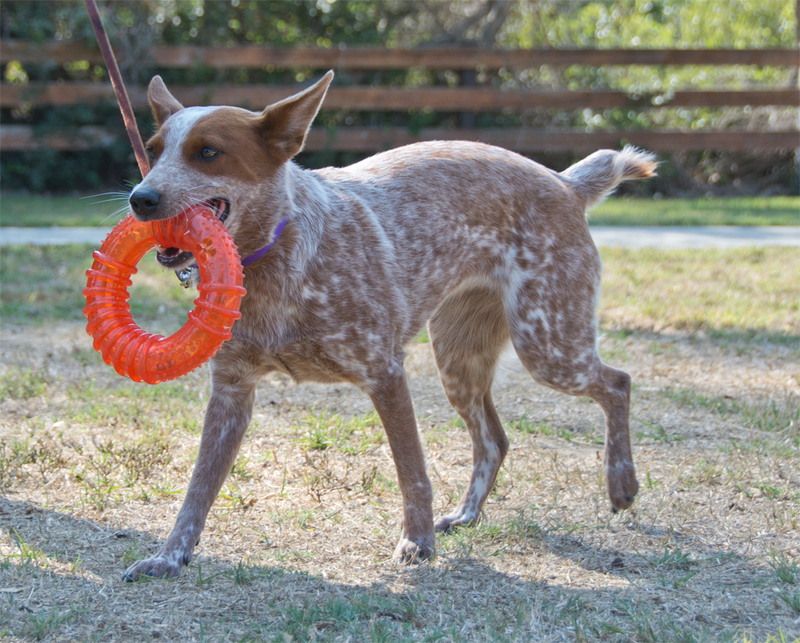 The ball rolls and is fun to chomp and squish. The Squeakee squeaks, and never rolls under the couch. 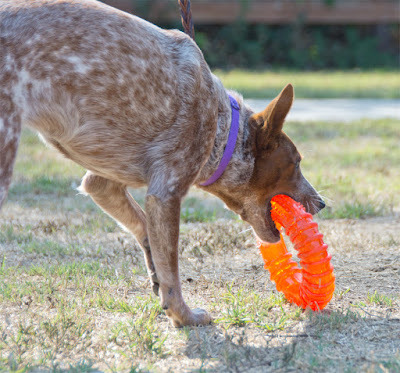 The Looper can be tossed like a frisbee, used as a tug toy, and rolled like a wheel. It's a lot of fun to chase when it's rolling, but it doesn't get lost like a ball. It can dispense treats, but they don't come out nearly as easily as they do in the chew ball. Pros: Durable enough for a large amount of biting and chomping, though not intended for a serious chewing project. More challenging to get treats out than most of our other Starmark chew toys. Floats, bounces, and can be rolled and tugged for lots of versatile play. Cons: Probably easier to demolish than the Treat Dispensing Chew Ball just because of the smaller diameter. May be too difficult for some dogs to get the treats out consistently. Bottom Line: When I first saw the Looper I thought it was just a variation on an already good toy, but it turned out to be surprisingly unique.